Melanodiazotrophs (black algae) – a cocktail of photosynthetic pigments enables these microbes to gather the energy required to fix nitrogen. They are responsible for the large amount of ammonia in the atmosphere and in certain bodies of water. Intracellular symbiosis with a red plant gave rise to the black plants. Eurosea (red algae) – includes autotrophic and heterotrophic variants. Like the red plants, photosynthetic Eurosea acquired the red pigments from Allorosea by horizontal gene transfer. Allorosea (pink algae) – cultures of this ancient clade of algae appear pink due to a tough cell wall; this adaptation enabled the group to survive several mass extinctions from solar flares. As a trade-off, they cannot survive far from the region receiving direct sunlight. Thiotrophozoa – hydrogen sulfide-eating microbes that form the foundation of the darkside hydrothermal vent communities. Bacterioids – a generic term for the myriad bacterial organisms that carpet every habitable nook and cranny. Single-celled pseudofungus – a paraphyletic group of sexually reproducing heterotrophs. Most are pathogens or decomposers. Blue mold – a multicellular pseudofungus that ranges in color from gray to bright blue. Many are neutral, parasitic, or beneficial symbiotes of larger organisms. If an animal or plant has blue patterning, chances are it’s from a symbiotic blue mold. Fog of war – a mold unique to the rainforests of Aeneas. It spans the understory like a cobweb, efficiently catching decaying matter for nourishment. To a passing explorer, it looks like the trees are shrouded in a thick mist. Razor plaque – a colonial pseudofungus that carpets rocks in intertidal zones with abrasive mineral deposits. Fully aquatic plaques form colonies in tropical reefs. Large animals are all but excluded from these zones. Those that are carried in by the tide will likely wind up in shreds and die quickly of fungal infection. A diverse community of hard-shelled animals and small, nimble swimmers thrive off the reef’s trappings. The lifeform itself is an unusually large single cell with a complex membrane system for acquiring and digesting food. 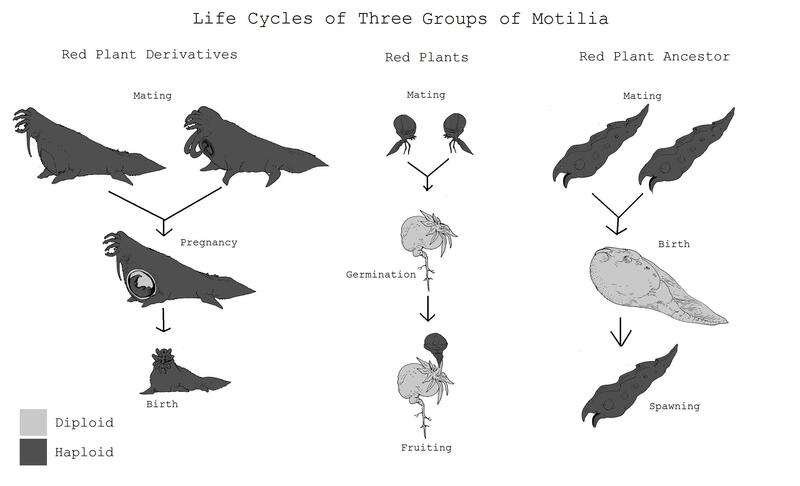 Plicozoa –an evolutionary grade of basal motilia characterized by their mode of embryonic development. Plicozoans begin their development as a plane two or three cells thick, which folds into a tube to create a gut. The resulting seam, known as Hovsepian’s line, contains stem cells that differentiate into most of the organ systems. A majority of plicozoans are wormlike. Others close their gut during later development in favor of filters, blind guts, and other feeding systems. Red plants – horizontal gene transfer from pink algae granted one group of plicozoans the ability to produce the pigments and enzymes necessary for photosynthesis. The earliest red plants were aquatic, but they quickly adapted to colonize the land. As the first multicellular photoautotrophs, most abandoned their ancestral filter feeding lifestyle in pursuit of this newly available niche. However, they still retain some animal-like traits, like the production of mobile fruiting bodies that can swim, crawl, or float to carry their offspring to faraway lands. Black plants – symbiosis with black algae allows these plants to grow in locations that are too shady for red plants. 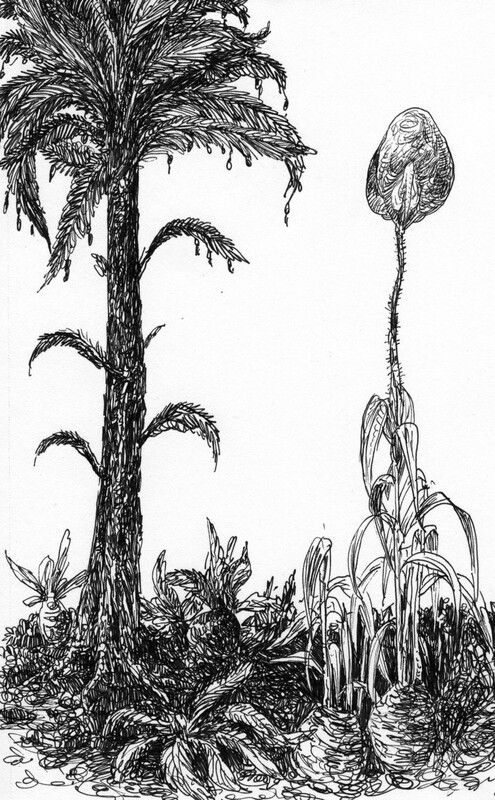 Ancestral black plants were not much more than black versions of their red progenitors, but they lacked the ability to produce mobile fruits, opting for rigid seed casings instead. Modern black plants exhibit secondary growth and a well-developed vascular system (derived from the plicozoan gut) terminating in hair-thin microphylls. These are an outlet for thermoregulation, as black plants are prone to overheating, and are less likely to be shed in high winds than true leaves. Red plant derivatives – eventually, an aquatic red plant lost the need for the plant phase of the life cycle entirely, and the first red plant derivative was born. This fish-like mobile fruit evolved to cross oceans from coast to coast, an exacting journey that required the seed carrier to eat, respire, and produce copies of itself if necessary. The lineage gave rise to most of the megafauna on land and in sea. Red plant derivatives are not photosynthetic. Instead, the pigments have been repurposed to carry oxygen in the bloodstream, giving the animals their characteristic pink hue.